Do you want to learn how to increase your income by 2-3 times more than your monthly rentals? Have you ever dreamed of owning a luxurious beachfront home or a golf villa at your favorite vacation destination? Would you like to learn how to vacation like royalty and have someone else pay for the trip? If you answered “YES” to any of these questions, then you don't want to miss this month's TRIG Meeting on November, 20th at 7 pm featuring Brad Moncado. 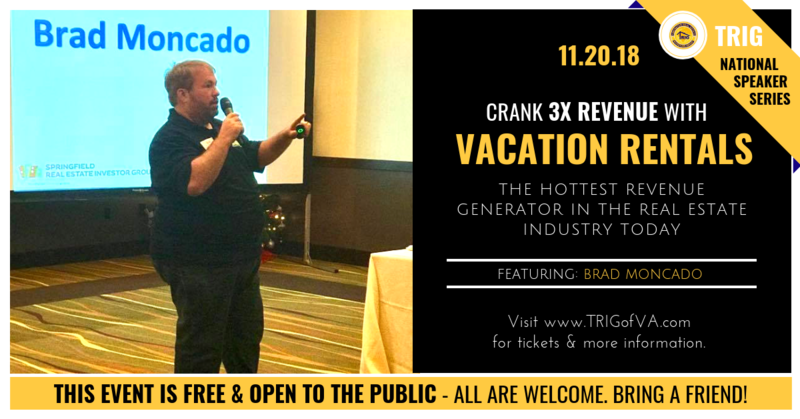 Brad and Pam own 7 vacation rentals and they will be speaking about the hottest revenue generator in the real estate industry today, Vacation Rentals. Vacation Rentals (VRs) are in super high demand and they are extremely profitable. This rapidly expanding industry has taken the real estate market by storm. Every family that goes on vacation would much rather rent a whole house than being stuck in a tiny little hotel room with no kitchen or laundry facilities. They’re in search of privacy, their own pool, hot tub, backyard, and grilling area rather than share these amenities with complete strangers. This your chance to catch an amazing training on Vacation Rentals and you definitely don’t want to miss this! Here are just a few of the topics they will cover. Brad’s great strategies on increasing heads in your beds and considering his properties rent for over $420 per night this can really increase your bottom line. We look forward to helping you increase your profitability on your buy and hold investing! Brad Moncado is Co-Founder and now the owner of the Springfield, Missouri Real Estate Investor Group, and a full-time real estate investor with years of experience in new home construction, flips, wholesales, lease options, and creative financing. He specializes in operating several vacation nightly rentals as well as educating real estate investors in the art of creating maximum passive income from owning vacation rental properties.